How to get there: The mountain (which is rather a small nunatak) is located on the main Greenland Icecap west of Martin Knudsens Nunatakker at approximately North: 73 ° 06' and West: 29 ° 15' . From our general area this trip involved a crossing of Victor Madsens Glacier. Route description: The nunatak itself is an easy scramble. The significance of this trip was the long skiing tour exploring a large area in a single day. The route was as follows: First south-west from Base Camp towards Torstind. Then down the glacier between Torstind and Hybens Bjerg (north of Torstind). The ski descent here was easy and good, thus this route can be recommended also for parties pulling sleds. At the bottom of this glacier Victor Madsens Glacier flows in a north-south direction, one can also see some of the starting points (arms) of the huge Nordenskiold Glacier. I subsequently crossed Victor Madsen with difficult snow conditions. The sun had repeatedly melted the surface (every day) which then had frozen (every night) forming icy formations all pointing south at a 30 to 50 degree angle. The skis would tend to get caught, it was hard to ski below/between, but also next to impossible to ski on top of these structures. My route proceeded just north (right) of the southernmost Martin Knudsen Nunatak and up the glacier towards a pronounced pyramid shaped peak. There was partly little snow and therefore quite icy conditions, partially also with water on the surface. The route continued on a wide turn towards north-west, curving below (east) of the pyramid mountain and north of it. Here the snow and therefore skiing conditions became excellent, solid, firm surface with a few centimeters of new snow on top. I climbed out of the valley and continued west onto the flat, main Greenland icecap, finally! I was here, sensing the vast, flat ice stretching to the horizon and beyond. All that remained was a few small scattered nunataks, then no more rock, only ice. 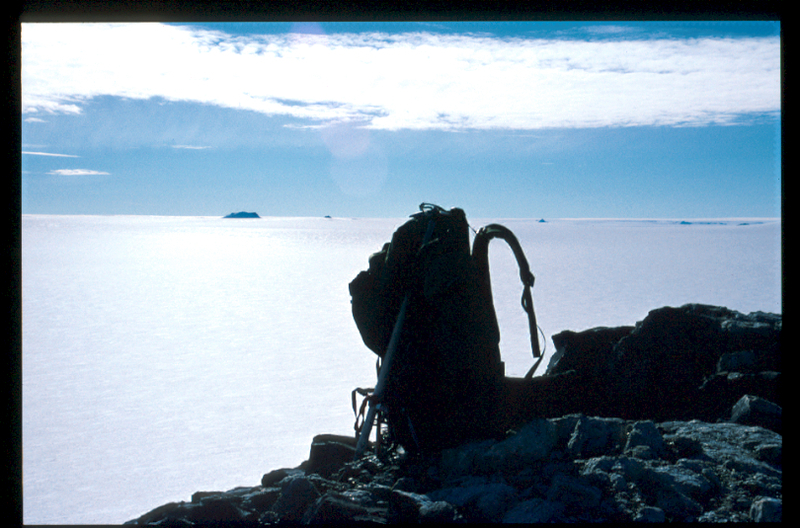 I climbed the nunatak, called Revet (the reef, just a small sign of "land" in the vast ocean of ice..). Enjoying the late evening sun from the north and planning a route back to camp. This was quite an extensive solo skiing trip, the feeling of being here, close to midnight, so alone, so quiet, in a landscape perhaps never crossed by skis before, well it cannot be described it must be experienced. I guess, very few people can share this unique type of experience, it was quite a trip!
. In order to maximize the exploratory aspects as well as making the trip more interesting, I decided to ski further north on my return to Base Camp. 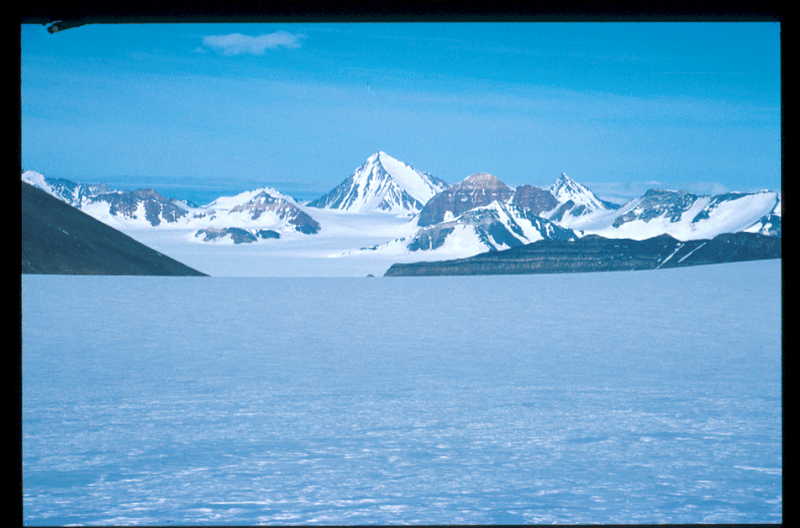 Thus, I skied north of the Martin Knudsen Nunatak that had been to my north (right) when skiing west. In this way, I would completely circle a substantial mass of mountain. The skiing down this glacier valley was very nice, the snow was better and the slope made for a nice run at acceptable speed. I stayed a bit on the south side in the valley, but ran into a crevassed area further down that made me shift more to the center. At the very base of this valley where this glacier meets Victor Madsen, there was an ice lake with further features that looked less attractive for a single skier. I therefore stayed well to the north (left) of these details as I started the long crossing back to the east side of Victor Madsen. Upon reaching the east side I climbed around the southern tip of Ulvekam towards the west side of Pålsryg. My route continued north between Ulvekam and Pålsryg after a careful crossing of a serious crevasse about half way up the slope. This crevasse was completely covered by snow, but I probed the area and my ski pole made the whole thing collapse with a long lasting, somewhat scary sound of ice and snow tumbling down for quite some time. Emerging around the northern tip of Pålsryg, more care was still needed while navigating through another crevasse area on the way back to Base Camp. Comments: This trip will always be remembered as a unique experience, that only very few can ever do. I returned to camp in the early morning hours. A fantastic ski tour in an unparalleled landscape combined with excellent skiing conditions across virgin glaciers between unclimbed mountains. A lone man in this enormous park. The silence and grandeur have an impact on your mind and memory that is beyond words. View east a bit north of Revet. Peterman in the center, the rockface is Torstind. 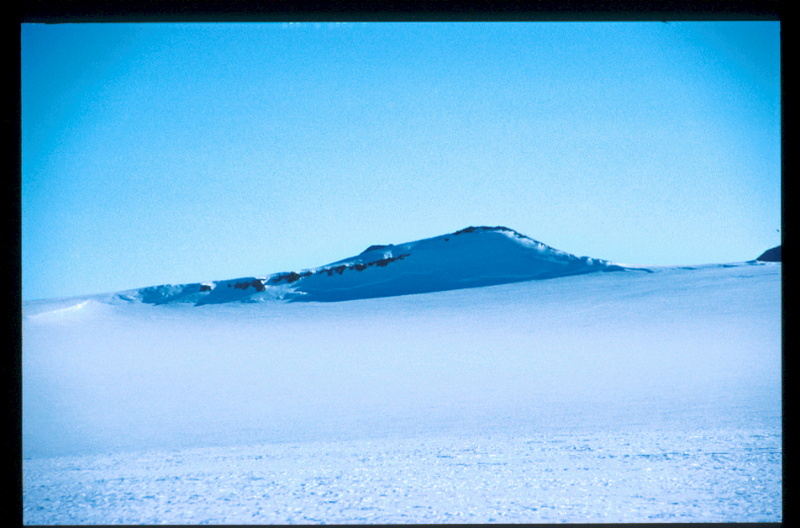 View west from Revet, this is the main Icecap.